Exclusive: Because he had commanded Allied forces in World War II, President Eisenhower understood the excesses of the war industry and warned Americans about the dangers of the military-industrial complex, a force that continues to siphon off tens of billions of tax dollars, as Jonathan Marshall explains. America’s military procurement machine may be the single most successful system of wealth transfer ever devised, moving tens of billions of dollars every year from ordinary taxpayers into the pockets of big defense contractors and their allies in Congress. But as a provider of working equipment to defend the United States against realistic threats, it is becoming more and more dysfunctional with every passing year. At the same time, the Pentagon is also asking for even greater sums to modernize conventional weapons systems that are better suited to East-West conflict scenarios of the 1950s than to today’s skirmishes with insurgents in the Middle East, Asia, and Africa. Spending on major military acquisition programs is projected to soar 23 percent, after adjusting for inflation, from fiscal year 2015 to 2022. Worse yet, Congress and the administration are spending much of that money on weapons that don’t even work as advertised. 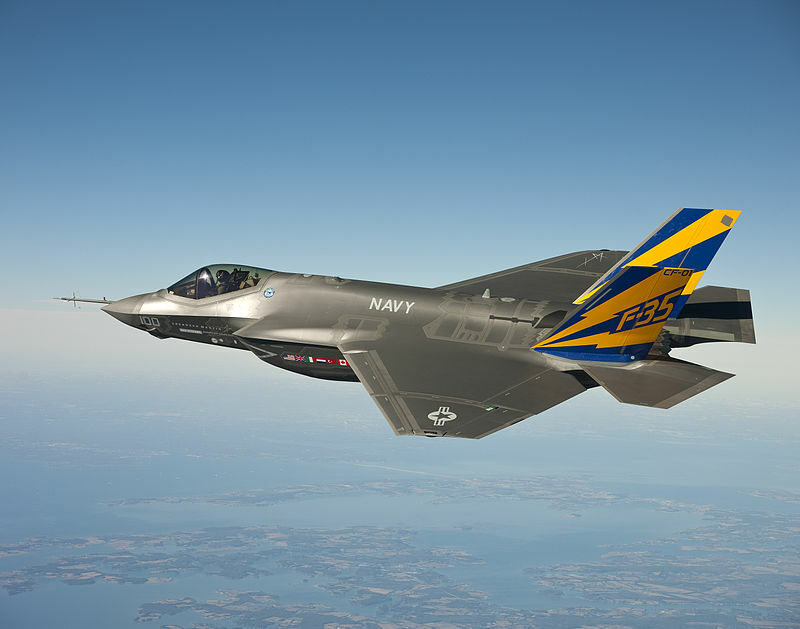 One of the biggest drivers of new procurement spending today is the F-35 Joint Strike Fighter jet. The plane is too expensive and sophisticated for simple bombing runs in Syria or Afghanistan, but too crippled to use in dogfights against Russia’s or China’s most advanced fighters. It’s ideal for one purpose only: With a total projected program cost of more than $1 trillion, this program will keep Lockheed Martin and its subcontractors in 46 states afloat for at least the next two decades. The F-35 program was awarded more than $12 billion in the omnibus spending bill that passed Congress in December for fiscal year 2016. That money is slated to buy 68 planes, up from 44 purchased in fiscal 2015. Over the entire life of the program, the Pentagon expects to acquire more than 2,400 jets. Critics note that the plane has been grounded because of safety, software or other technical issues, including jets catching fire on the runway, 13 times since 2007. The latest glitch is an over-weight helmet, costing $400,000 a pop, which can cause fatal whiplash for some pilots. Until it is redesigned, pilots weighing less than 136 pounds are grounded. As of last year, the same helmet was still unable to let pilots distinguish friendly aircraft from foes, a rather critical capability when they are shooting at blips on a radar screen beyond visual range. The stability of the planes’ engines was rated “extremely poor” and other key systems were unreliable as well. A test pilot who flew the F-35 in mock air battles in January 2015, against an older (and much cheaper) F-16D, reported that the newfangled jet was incapable of outmaneuvering the F-16 in a dogfight. That was true even though the test was rigged by making the F-16 carry heavy extra fuel tanks to slow it down. The F-35’s builders have proven their superiority at political firepower, however. The Center for Responsive Politics reported that in 2014 the plane’s main contractor, Lockheed Martin, forked over $4.1 million in campaign contributions, supplemented by $7.6 million in contributions from three subcontractors: Northrop Grumman, United Technologies, and BAE. Their money poured into members of the House Armed Services Committee, House Appropriations Committee and Senate Appropriations Committee, as well as Senate Majority Leader Mitch McConnell of Kentucky. The F-35 isn’t the only dysfunctional weapons procurement program draining money today. Its predecessor, the F-22, proved to be an expensive dog, suffering a critical failure after every 1.7 hours of flight, on average. Although first flown in 1997, it was not allowed into combat until 2014, on a mission over Syria. Or take the Navy’s Littoral Combat Ship. Designed for missions close to shore, it has an experimental aluminum hull that may be vulnerable to rough seas and melt at high temperatures (such as caused by a missile or bomb strike). No one will know for sure until at least 2018, but in the meantime, 24 ships have been built or are under construction. Defense Secretary Ashton Carter has asked for cutbacks in the program, but the Navy is in open revolt. But don’t applaud the Pentagon’s civilian leadership too quickly for challenging the Navy. Carter reportedly wants to use some of the savings from the ship program to buy more F-35 fighter jets. Jonathan Matshall, Too many disappointing reviews of Eisenhower’s speech, such as yours, fail to note he said TWO factions endanger our democracy. TWO is the Scientific Technical Elite who, in academia’s ivory towers and rigged-bid research programs, (they) decide what science gets funded, which disease gets lab work, where patents are granted. And so on. Read what Ike said he feared (the dangers) in the STE faction. So far, (2016), the results are ‘secret’ intelligence, global warming denial, needless colonies on Mars, psychological numb-and-dumb pills, internet intercepts, war-death drones — for instance. And not public education improvements and updates, not personal healthcare provisions or public health surveys, not toxic contamination (pollution) suppression, no delegations for peace R and D, (just saying “peace science” sounds funny to our stress-deafened ears), and no inventions competition — to name a few things the Scientific Technical Elite dismays. TWO is the Scientic Technical Elite who, in academia’s ivory towers and rigged-bid research programs, (they) decide what science gets funded, which disease gets lab work, where patents are granted. And so on. Read what Ike said he feared (the dangers) in the STE faction. He knew it could be done, and how it could be done. He saw in light of that an out of control continuous mobilization in progress, fighting the Cold War. Our capitalism has two loopholes; military industry and tax haven. They are exempted from “transparent market competion” or democratic accountability. The loopholes are, however, inherent and essential for the economic system to operate for the rich class. Calitalism always and still now need primitive accumulation compensated by nameless people. Read the PNAC white paper. Its all there in plain sight. We have no choice. The USA has committed so many atrocities around the globe that if we ever lose top billing at anything the rest of the nations will rightfully attempt to utterly destroy America. I’ll be brutally honest, I want to stay on top. The rest of the nations are just a bunch of niggers I want on the USA’s plantation so I can buy cheap stuff made in sweat shops by little brown/yellow people who will die before they are 40. The alternative is that Merica becomes THE giant sweatshop to the world. One half of the welfare-warfare state. I was thoroughly dismayed when I came to the realization that the military did not seem to consider the bigger picture of its reason for being or its effects on the whole of the economy; rather, each individual unit or branch fights to maximize its own well-being, perhaps this is human nature. Gotta love government budgeting: if you come in under budget, you get less next year, if you’re over you get more, so there is no reason to save and every reason to be extravagant. “It’s the end of the fiscal year, what can we buy?” Insane. Meanwhile other units, such as Marine infantry units, could not afford body armor or properly-equipped Humvees in the beginning of the Iraq war. If non frontline units cut back their spending even one day, the savings could buy the necessary equipment for all frontline units, but we’re told that they’re “different pots of money.” Enough with the rant, but having seen it firsthand, it’s f***** insane, as most gov’t programs are. The only error I see in this article is in the introduction where it states “…military-industrial complex, a force that continues to siphon off tens of billions of tax dollars…” – – – it should read HUNDREDS of billions of tax dollars. We could easily cut 20% of the 500 or 600 or $700 Bn per year (whichever accounting method they want to use to measure it) and STILL be the most deadly military in the world, even with all the bogus boondoggle weaponry the article talks about. Whether or not being the most deadly military in the world is a laudable, ethical goal is another major question, but even that aside, it’s just a profligate scam that probably won’t stop until this country suffers an economic meltdown, and/or instigates WWIII (the Final Chapter). So, where are all the tea baggers screaming “Stop Spending”? Oh, that’s right they only do that for spending on food assistance, education and health care. For trillion dollar failed military boondoggles not so much. So, how are conservatives fiscally responsible? Pathetic! You’re confusing the Tea Party with the neocons. When reality in Washington is restricted to the circumscribed confines of major players’ agendas, is it reasonable to expect basic tenets of morality and ethics to prevail? As for sanity, there doesn’t appear to be much hope for the little that exists. When members of Congress begin their deliberations each day with a blatant act of hypocrisy – reciting the pledge of allegiance – what hope is there for some decency thereafter? Don’t forget the “Chaplain” leading in “prayer”. I recently read about the launch of the USS Sioux City (LCS-11). Looking it up, I found it to be a 3500 ton speedboat with extremely light armament. All this for $700 million dollars. The US is buying another dud in a high-speed transport for a mere $217 million dollars. To keep the weight down they made the hull so flimsy that the ship could well be crumpled in heavy seas. The F-35 is a disaster, and driving a wooden stake through the program’s heart needs to be done pronto. A right-wing site has what looks to me like a sensible prescription. The Gripen E has a U.S.-made engine, the GE F414, which is also the engine of the F-18 Super Hornet. The Swedish Air Force is buying its Gripen Es for $43 million per copy, less than one third of the price of the F-35. Its operating cost per hour is less than a tenth of that of the F-35â€™s. In fact it is the only aircraft that meets the selection criteria of the Joint Advanced Strike Technology program that spawned the F-35: that the acquisition and operating costs be not more than 80 percent of that of legacy aircraft. Buy the rights to the Swedish Gripen and build it here. It’s too sensible, and for that reason alone isn’t likely to happen. At least our F-35 pilots won’t have to suffer any indignities from dog fights with Swedes in Gripen fighters. “The Center for Responsive Politics reported that in 2014 the planeâ€™s main contractor, Lockheed Martin, forked over $4.1 million in campaign contributions, supplemented by $7.6 million in contributions from three subcontractors: Northrop Grumman, United Technologies, and BAE”. That isn’t even pocket change. Less than $12 million invested to earn (if that is the right word for such a scam) $1 trillion. I make that a return on investment of about 8 million percent. ‘Current administration plans call for spending a trillion dollars over the next 30 years to â€œmodernizeâ€ Americaâ€™s nuclear arsenal to fight a pointless war that would decimate major centers of civilization across the globe’. I think “decimate” is a gross understatement. After all, it means “to kill one in ten”. A thermonuclear war would, at best, leave one-tenth more or less intact – but saturated with radioactive ash and fallout. On the whole, I think “incinerated” and “poisoned” are the mots justes. Or, perhaps, just “obliterated”. The idea that the United States has no alternative but to spend nearly as much on defense as the rest of the world combined, is the greatest con job in human history. Read Eisenhower’s farewell speech. Read it over and over until you memorize it. What Ike said is still completely valid. It’s certainly one of the nominees. The corruption is breathtaking. And deadly. The greatest con job in human history is the creation of fractional reserve banking and the FED ponzi which funds the MICs insatiable appetite. Alex T is absolutely right. But the FED con is difficult to see and not easily understood, the MIC con is basically right in your face. People keep jabbering about how Sanders wants to give “free” health care to all Americans, “free” college education (to those with the ability/desire for college) etc. But no one seems to want to touch the military-industrial complex with all the “free” weapons etc. that do NOT serve the American people! Lockheed Martin, TRW, Hughes, Northrup Grumman etc. get billions in “free” stuff every year from Congress and all it brings us is more terrorists on our soil, human death and maiming, the destruction of neighborhoods, health clinics, hospitals, schools etc. in far away lands and thus the hatred of Americans all over the world! I for one want to see Congress do a better allotment of U.S. taxpayer funds AWAY from The Pentagon, CIA, NSA etc. and instead fund the human needs of ordinary Americans with an “Improved Medicare for All” health care system and funded trade school/college educations for our youth and the creation of high paying jobs fixing our depleted infrastructure, building quality schools and hospitals and affordable housing so no American need be homeless! I wish the answer were easier to manage with congress, but one would first have to pretend they care about the people of our nation in a fundamental way. Abbywood, when you have time, check out the locations of the ‘dog-in-making’ (the F35) and you’ll see that parts of the plane are made in almost every congressional district. Is this a coincidence? No. Who wants to lead the charge against jobs in their own district? Especially if they have received donations to play along and not rock the trillion dollar sinking boat? I would suspect, if the parts and supplies for the F35 were not strategically placed in congressional districts, this dog would have been off the table years ago. This observation to keep the MIC in a state of perpetual existence applies to other non-DOD government agencies as well. Who is out there that we have to fight? we have more toys than we know what to do with!